After grueling semesters at various universities, several of the Summer 2009 interns living in the New York/New Jersey area are back at the AMNH lending a hand in the final stretch of the NSF Type Rehousing Project that’s terminating in March 2010. During these last few weeks of the year the attention has been shifted entirely to rehousing the remainder of the type specimens. Although there are only a few interns, we have been able to develop a good pace. At the beginning of the first week back we were faced with roughly 200 specimens in need of rehousing, after three weeks of readjusting and mastering our hand skills with ethafoam once again we have brought this number down to 100 specimens left for completion. Judging by the progress made as well as the large amount of help to come, we are feeling quite confident that the fifth floor as well as the Type Rehousing Project will be completed by March! There is rarely a day when we don't encounter an interesting or sometimes mysterious issue associated with a specimen. One of the types we came across contained a terse note reading “too many mandibles” and quick inspection revealed three mandibles housed with the rest of the specimen. A veritable scavenger hunt for information ensued and it was discovered that while all three mandibles belonged to different individuals, they all had a link to the type. 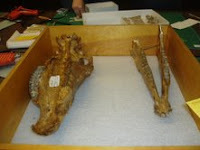 One jaw was figured in the publication of the type, one was labeled with the type’s specimen number, and one was a perfect fit for the maxilla of the type. Since none could be eliminated, all were rehoused with the specimen. 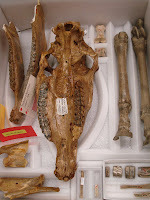 While there may be excitement in the future when a researcher comes across this specimen and believes that she/he is looking at a fossil of Cerberus, there won’t be any need to spend time hunting down the publication and other relevant information, since all the evidence has now been thoroughly documented and included with the specimen in storage, in the card catalogue and in PaleoCat. For those of you who have been following our blog entries, you may recall the week of our tour in the Department of Exhibition. 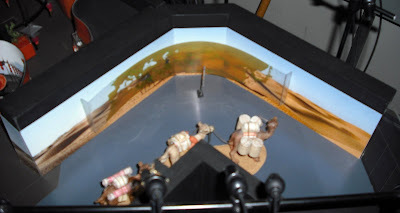 During the summer we were given a sneak preview of the Traveling the Silk Road Exhibit, where we were able to see a model designed down to the smallest detail by their team of preparators. Fortunately the Silk Road Exhibit is now open to the public! 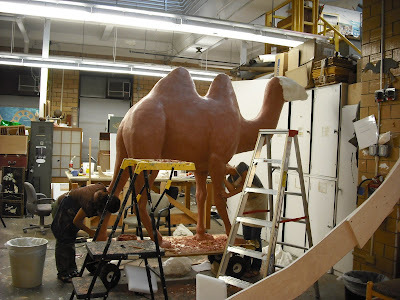 ​As you enter the exhibit you are greeted by a caravan of camels, which happen to be the same camels that we saw in their preliminary stages during the summer. As you wander through the four cities starting in Xi’an and ending in Baghdad, you learn about the different technologies and cultures associated with the Silk Road. The exhibit highlighted key techniques used in the tedious process of silk making, and the harvesting of silk worm cocoons. Each caterpillar cocoon is made of one continuous strand of silk which is then transferred onto a loom and woven together. These looms were so sophisticated that they could be used to create intricate designs and patterns. It was amazing to have seen the beginning stages of this exhibit, and then to have had the opportunity to enjoy the incredible final result. This was the final week of the post-season here in the Paleontology Department of the AMNH or, as one child called it in an interview with Time Out New York, the Dinosaur Museum of Magical History. While we've been working to finish up all the projects we took on this summer, much of the Vertebrate Paleontology department is in Bristol, England at the Society of Vertebrate Paleontology annual conference presenting projects they've been working on all year. Feeling like it's finals time in algebra class, we've combined notes and numbers from georeferencing and are proud of our progress. Just in the overtime, the small group of us left completed 26.9% of the lat/long searches out of the entire 1808 item list from the very beginning of the project. Unfortunately, about 6% of the remaining localities cannot really be elaborated further. This is out of our hands though, since the locality on the labels, and catalog cards are sometimes as vague as "Decatur County, Kansas" or "None Given." Over the course of this last week we've rehoused everything from rodents, cats, and dogs to bears, primates and other species from some of the rarer mammal families. 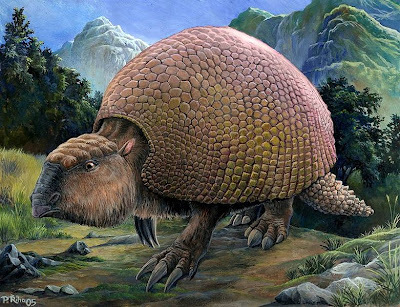 One of the more interesting genera we came across this week was the Glyptodon - an armadillo relative that's roughly the size and shape of a Volkswagon Beatle! We've seen quite a few interesting specimens as we've worked across the 5th floor and while we won't reach the lofty goal we set of finishing all the type specimens on the floor, we're leaving Alicea in a good position. We're finishing out the week keeping in mind that others will continue where we left off. It's important to leave reports for future interns and volunteers to read, to store all our materials in a place that's easy to locate and access, and to break down our work stations and leave the collections tidy. We wish Ruth, Carl, and Alicea the best of luck as they continue on these endeavors. We're in the 4th week of the post season here at the American Museum of Natural History and with less than two week remaining we're looking at the 5th floor (the only floor with fossils still in need of rehousing) as a sort of bowl game - an extra chance at the end of a great season to take on one more challenger. Will the 2009 summer paleontology interns come out victorious or will entropy still lay claim to some of the types on the 5th floor? While the floor has plenty of type specimens in need of rehousing, we've been making quick work of them due to their small size. 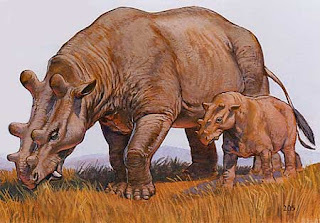 Most of the fossils we've pulled so far have been rodents or small feline and canine relatives, but then came Eudinoceras - an Coryphydont from Mongolia, closely related to Uintatherium, pictured here. We welcomed the challenge and gave it a great new rehousing, but we are keeping our fingers crossed that we don't come across any of its relatives, as specimens that large (think 50+ pounds just for the skull) take about 5 times as a long as a small specimen. We've also been working with volunteer Alyssia to train her into rehousing. She'll be at the museum once a week throughout the coming year and will be continuing the type rehousing project. 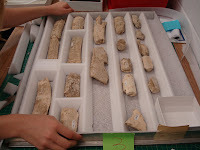 Even if we interns reach our goal of finishing the 5th floor, other type specimens, either ones that are returned from a loan or found in future inventorying of the fossil mammal collections, will be in need of rehousing. She's already helped us with a challenging in-drawer rehousing, so more manageably sized fossils will seem like a piece of cake. A few weeks ago we received a comment on the blog asking for more details about PaleoCat. As we mentioned before, PaleoCat was developed specifically for the needs of the Paleontology department of the AMNH and is a great tool for research and collections management alike. It can be used to locate a specimen in the collections, identify all the fossils from a given locality, or print specimen labels. While information is still being added to the database, when complete it will contain data ranging from a fossil's storage location to its taxonomic information to a list of publications on the specimen. The georeferencing work that the interns have been doing all summer is part of this process to enhance PaleoCat. Once we upload our work, a researcher will be able to find the country, state, county, and even the exact coordinates where the fossil was excavated. It can't be underestimated how important it is that locality information be easy to access when studying a fossil - it puts the animal in context relative to the climate it lived in and the plants and animals it lived with. 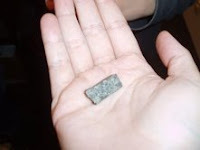 Take, for example, fossils from the "Telegraph Line Camp" in China. If you haven't heard of it before, its not the sort of place you can look up in an atlas or type into Googlemaps. Since China is such a large country there are plenty of regions it could have come from - perhaps the coast, or the desert, or maybe the mountains. After our georeferencing is uploaded to PaleoCat, you'd be able to find out that the Telegraph Line Camp is in the Xilin Gol Province of Inner Mongolia, a place that isn't so hard to find on the map. Pictured here is a monument to fossils found in the region, located only a few miles from the Telegraph Line Site. Thanks for the question and check back next week to hear how the post-season wraps up! After a sad goodbye to half of our comrades-in-arms on Friday, the next Monday began with much reorganization of materials and space. Our goal was to determine how much of the scrap material could be saved and reused over the coming weeks. With the reorganization we were able to spread our elbows a bit more, providing a more comfortable work zone. 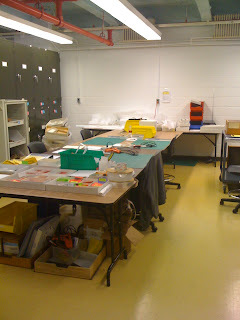 We began working on specimens that have been hiding on the 7th floor. With non-type specimens hiding with the types, specimens "missing", and specimens that only needed their type labels, it was an interesting day. But after much back and forth between the collections and the database and the staff, we were able to finally finish those troublesome specimens and close that chapter in the project (for the most part). We are finally ready to begin the last floor in the collection: floor 5! Floor 5 is the last floor in the collections that need types rehoused. We continued georeferencing on Tuesdays and Thursdays, like any other week. Those of us who were working on the 8th floor relocated up to the 10th floor, freeing up the 8th floor for the department volunteers. The work continues, with a couple interesting yet evasive localities providing a new look into the task. Locations like Edgbaw, Myanmar, a locality of Barnum Brown, has one of us emailing everyone under the sun to find more information. It has become the "Holy Grail" for her and she does not want to give up on it until the end. We pooled all of the work finished by the interns over the past two months. We copied it all back into the master copy of the georeferencing file, then split it up again between the three of us who are left. With two of us focusing on localities within the USA, the third intern is working on localities outside of the country. The number of localities seems to have doubled since we first splite them up two months ago, so the task has become a little daunting. But we're up to the task! We're still searching the library and the archives, still finding ramdom sources online and still poking through those catalog cards for even the smallest bit of information that can help us in our search. As a fitting achievement for our final day, we reached our goal of finishing type rehousing on the 6th floor. We’ve been working on that floor for two weeks and breathed a sigh of relief that we could see it to completion. 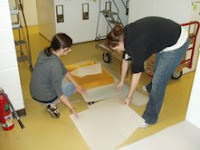 The floor has proven especially challenging because we originally thought it contained only a few type specimens in need of rehousing, but a survey done by volunteers as well as our own run through of the type-inventory sheets revealed we had a long way to go. Some types tried to remain elusive, but with our powers combined, we tracked them down, scattered throughout the cabinets though they were. Many of ‘hiding specimens’ were so large that they required in-drawer rehousing, such as the skull pictured here. The large size of the fossils on this floor is no surprise considering it’s the floor containing Rhinos and their relatives. While working on some of the biggest type specimens to date, we became pros at in-drawer rehousing and developed some new creative ways to work on that scale. At the end of the day, we compiled information on what we had done over the course of the internship and strategized about what needs to be tackled in the post-season (those of us whose school schedules aren’t whisking us away right now are staying for another 5 weeks to continue work on the project). We're proud to say we entirely finished Element Descriptions and sent them to Ruth to be uploaded to Paleocat. We made a lot of headway in Georeferencing; most of us identified locality information for the country, state and county of each of our roughly 160 localities and spent the final week tracking down latitudinal and longitudinal information. And we wrapped up type rehousing on all but one of the eight floors of fossil mammals. On Wednesday we visited the Anthropology Department and were guided by Paul Beelitz through the various collections in the department. At the start of the tour Paul gave us a quick breakdown of the field of Anthropology into its components, Physical Anthropology, Ethnology, and Archaeology – for a link to those definition click here. The AMNH has collections of material from each of these three subject areas, primarily from the New World: North, Central and South America. Some of our favorite artifacts on the tour were the Hopi dolls, known as kachina, which the museum has been collecting since the late 1800’s. It was fascinating to see what has changed and what has remained the same in the making of kachina dolls in over that period of time. Other highlights of the tour included a teepee liner with a story depicted across it, a painting of the Buddha currently being researched for the untraditional location of texts on it, and a hand-made, life-sized, paper replica of a Peugeot bike from Vietnam. Finally, all of us were very impressed with the Smudge Room – an area for people with a personal (i.e. ancestral, spiritual, cultural, etc.) connection to artifacts in the collections to interact with them. Paul, who designed the room, said it is most commonly, but not only, used by delegations from American Indian tribes and is equipped with a ventilation system for smoke from incense, sweetgrass, and the likes. It was a pleasant surprise to find out that the objects in the museum are not alienated from their people and vise versa. We also had the privilege of a pre-work tour led by Doc Carl Mehling of the Fossil Halls (Hall of Vertebrate Origins, Saurischian Dinosaurs, Ornithischian Dinosaurs, and Fossil Mammals and Their Relatives). Carl worked on the most recent renovation of the Fossil Halls in the 1990's and told us the stories behind making the exhibits what they are today. 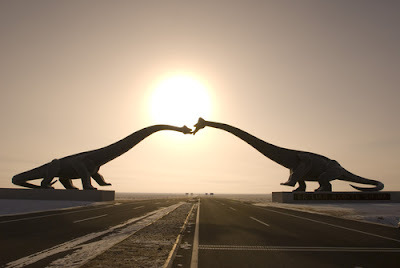 It’s safe to say none of us will ever see that, or any other, fossil hall the same way again. Firstly, Carl explained layout of the hall – instead of taking a chronological approach to the organization of the fossils there, as many museums do, the designers took a phylogenetic approach, recreating the cladistics of vertebrate evolution in the layout of the exhibits. This strategy focuses on evolutionary relatedness as opposed to shared time periods. Since many of the fossils (and footprints and eggshells) on exhibit are real – the layout of parts of the Halls was finalized using life sized replicas made of cardboard so that they could be moved and repositioned often without fear of damaging them. Keeping in mind how big some of the fossils are, the replicas sound like they were masterpieces in themselves. One of the most impressive attractions in the dinosaur hall – the real trackway of Apatosaurus footprints – was also one of the most complicated parts of the renovation. The trackway had been found in limestone and excavated in large slabs. When these slabs were given to the museum, the were plastered together on the floor. When the 1990’s renovation of the Fossil Halls took place, moving them involved forcing large metal sheets underneath them (to create what amounted to an over-sized spatula), turning the floor into a giant slip-n-slide with ivory soap and dragging the tracks across with pulleys. Now they’ve stood the test of about 150 million years of the elements and one AMNH renovation. 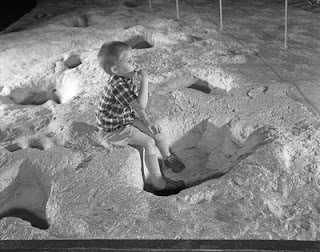 Here is a picture of the tracks taken in 1959 with a young boy sitting in one of the footprint - hope this gives you an idea of their scale. In addition to everything we learned about handling and rehousing fossils and always keeping locality data with a specimen, we leared a lot about the AMNH and the challenges and advantages inherent in such a large institution. Through the weekly tours we saw different ways each department deals with the challenges of maximizing storage space, fighting pest infestations and maintaining an organized collection. We also saw the myriad of ways departments collaborate. Whether is a mammalogist taking a fossil out on loan from Paleontology to compare its characteristics with that of a modern mammal or a paleontologist using the rock saw in the Planetary Sciences to cross section a specimen, the size of the museum means that there is an incredible wealth of information and technology housed in one institution. That's all for now, but thanks for following the blog in the 2009 season and don't forget to stay tuned for post-season updates! As our seventh week comes to a close we say goodbye to Karen who is leaving us on Saturday to head back to school (KAREN WE MISS YOU ALREADY!!). With the realization that the end is in fact drawing near we are remaining upbeat and are continuing our productivity! We are still working on the sixth floor but have made surprising progress and our goal is to complete the floor before our eight weeks come to a close. 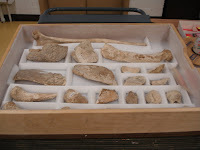 We have come across a few drawers which will need special attention and are to be done similar to the proboscidean specimens we were rehousing from the second floor. Many of the specimens this week have been Perissodactyls, mostly rhinos and rhino like creatures, but we have had a few strangers like Amphicyon ingens, the largest bear-dog show up. To date we’ve rehoused a total of 182 specimens and with each day that number grows! Georeferencing continues and is still going well; most of us have completed the first wave of finding country, state and county (or whatever the equivalent may be) and have begun the second wave which is finding latitude and longitude and in some cases township and range. Most of the localities require much research but others have wonderful notes both on the cards and with the specimens themselves (this is an important lesson for all you budding or current scientists TAKE GOOD FIELD NOTES!!). Google Earth is also a valuable tool as well as Earth Point which helps with finding the township and ranges. The element descriptions are winding down and most of us have finished our drawers. 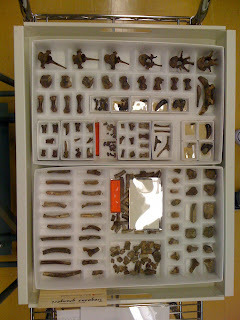 Once all the drawers are finished we’ll have completed descriptions for a grand total of 17,605 specimens! It seems just yesterday we took on this daunting task and now in the final stages we feel quite accomplished! The tour this week was of Extreme Mammals, and extreme they were! Our first lesson was what makes a mammal a mammal? It turns out all mammals share at least three characteristics NOT found in other animals they are: 3 middle ear bones (the malleus, incus, and stapes), hair, and the production of milk through mammary glands. Notably, an important theme throughout the exhibit is convergent evolution. This occurs when two unrelated species have similar biological traits; in other words they evolve to resemble one another but in very different ways. 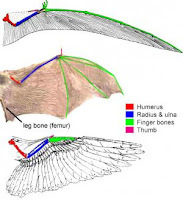 A great example of this is the wing seen in birds, bats and pterosaurs; they all use it to fly but in each case the bones of the skeleton have been modified in very distinct ways. The entrance to the Extreme Mammal exhibit is quite impressive! Upon entering you are greeted by a life size replica of Indricotherium, which you then walk under to access the rest of the exhibit. By having the opportunity to walk beneath this specimen you are able to gage just how massive these creatures were! It turns out they measured a staggering 16-18 feet at the shoulder, with their closest living relatives being rhinoceroses. The exhibit also boasts a wonderfully preserved specimen of Darwinius masillae (fondly named Ida), a primate from the Eocene (about 47 million years ago) from Messel, Germany. Diprotodon, the largest marsupial to ever live! Glyptodonts, which are related to armadillos, and lived during the Pleistocene of South America , eventually migrating up to North America during the Great American Interchange. Some of these guys could grow to the size of a VW bus! Overall, the most important aspect of this task is to figure out the country, state, and county location of each specimen on our list. If along the way we find the latitude and longitude within our research, whether it be noted on a catalog card, map, or publication, we add it to our spreadsheet. One simple but helpful technique that has helped us find the specimen location when the card catalog, internet, and periodical research has failed has been going into the cabinets and looking at the actual specimen. In some cases, the locality, or at least more of a clue to the locality, has been found on the tags and random notes left with the fossil. In other rarer (albeit awesome) cases, the specimen has had the localities and stories (think paragraphs) written on them. A more complex problem we have come across is locations that span 100 or more entries in our excel database that needs to be further broken down. For example, one list contains about 100 entries from San Jose. In order to pin point the county locations for these entries we had to find quadrangle maps in the archives that luckily had the specimen locations marked on them. Quadrangle maps are topographic maps of Quadra- squares broken into quarters, those quarters broken into quarters, and so on: a structured way of zooming in on paper. We are now in the process of finding the location of each specimen by using the longitude and latitude found on the maps and plugging it into Google Earth to find out what county it lies in. Sometimes the coordinates do not come up on Google Earth so we have some things to further explore. Happily, as this week comes to a close, many have finished the country, state, and county location and have moved on to entering any latitude and longitude locations found. Chelsea, our georeferencing go-to girl, has asked for each intern to leave her a note on what is completely finished, what needs to be researched further, and what is going to be impossible to pinpoint. Next week we will have a meeting discussing what has been accomplished, what can be further explored, and how to find the longitude and latitude of locations that we did not find in passing research. By the end of next week, many will be done with their drawers for element descriptions! At that point, we will help each other finish up and perhaps gain more time for georeferencing and rehousing. We have finished rehousing specimens on the lower level, the third floor (including extras that were later found for us), as well as the second floor. Next week we will begin to tackle the 4th, 6th, and 7th floors, and finally we will make our way to floor 5. This week the bulk of our rehousing was on the second floor. 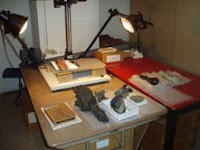 What was different about this floor was that we had to build many of the specimens into the drawers due to their size and weight. Some of these specimens include mammoths, mastodons, gomphotheres and elephants. We also saw a smaller relation to elephants, the group hyracodontoidea- a modern example being the hyrax. Our first half of the tour this week was given by Petrologist Njoki Gitahi. Petrology is the study of the origin of rocks and we were shown rocks that had resurfaced from deep within the Earth. These rocks are very important because they are a great representation of our Earth’s mantle; what we can only otherwise imagine as we cannot go down to the mantle on our own. One such example was a Xenolith. A Xenolith (literally stranger-rock) is a rock fragment that becomes surrounded by a different type of rock during its formation. We also got to see some different types of hardened lava from Hawaii, most notably, Pahoeoe (which has a ropey look to it) and Pele’s Hair, the goddess of fire. Another type of lava we did not see but can be used as a contrast to Pahoeoe is Aha, a sharp and brittle looking lava also from Hawaii. Last, we saw some remnants of the aftermath of a volcanic eruption. One example was a stack of glass drinking glasses melded together. The second part of our tour was given by Joseph Boesenberg, a petrologist of meteorites. Meteorites can be likened to what we saw with Ms. Gitahi because they can be compared to rocks found within the Earth. Two types of meteorites we were able to see were iron, a meteorite made of metals, and stony, a meteorite made of rock. Some of our favorite meteorites included: olivine, a magnesium iron silicate that is named after its color – when held up to the light is gives off a stained glass window effect, an impact crater sandstone, which has many pockets of air, resembles the aftermath of folding egg whites, and floats like pumice , and tektites. Tektites are rocks that are liquefied and ejected from the crater when a meteorite hits the ground. 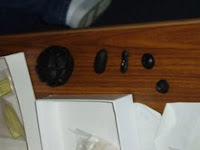 It was the general consensus that everyone’s favorite type was the button tektite. When the rock is ejected from the crater it flies forward, and its front area, in liquid state, comes around to the back giving off the button appearance. After discussing various types of meteorites we were told not to stand on the next rock passed around. After some confused looks we *drum roll please* got to hold a piece of Mars!! And no, no one attempted to stand on it. As our sixth week comes to an end, we are happy to know that many of our goals for the week have been reached in not only rehousing, but in georeferencing and element descriptions as well. We only have two weeks of the project left, but some of us will be staying on through September to carry on, and we are certain we will have more triumphs and stories to report back on!